I’ve been to a lot of conventions in my (long 😉 ) life and have had a lot of awesome experiences and encounters, both with ’stars‘ and with fellow fans. But this weekend was special on so many levels. So I’d first like to share how it felt to connect with the fellow Sensies. One major difference to other conventions was the fact that I had already connected with other fans via Twitter beforehand. 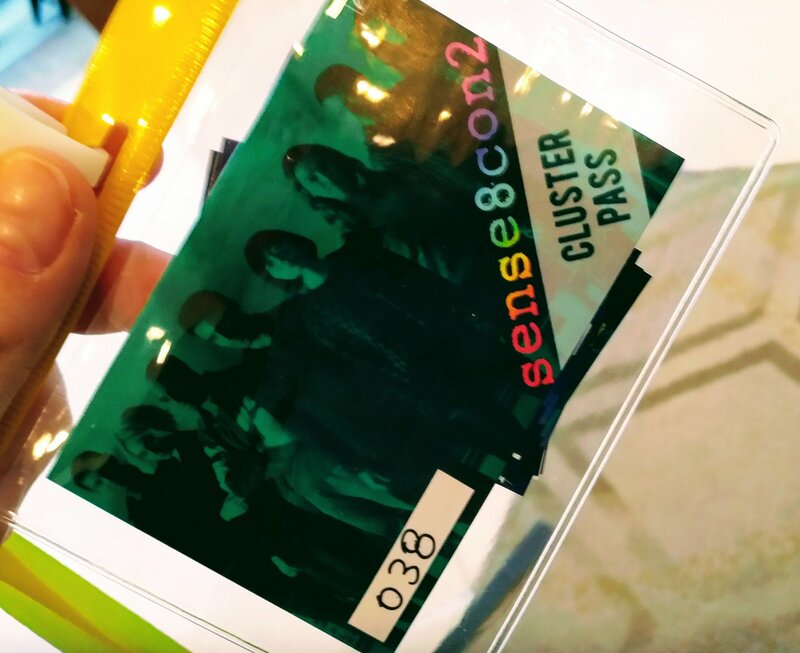 As I wrote (in German) in my first blogpost about Sense8, this fandom is the first in which I really got actively involved. And so there were a number of people I was already looking forward to meeting in person for the first time. The combination of the different styles, creating a cohesive final big picture will be itself a demonstration of how harmonious diversity can be when its effects are consolidated. There was one German woman I knew would be there: Manu, who has lived in the Netherlands for quite a while, being a German teacher. She spotted me in the hall and introduced me to Crystal from Colorado (who I envy for having met and hugged Max Riemelt last year) and Ine from Belgium. We didn’t have much time to connect at that point, as the Welcoming Party was about to start. Manu, Crystal and I did spend more time together later on and were able to really connect – up to the point when Crystal and I became what I called „crying buddies“ after the closing. We were both a complete mess and hugged it out. ❤ I’m really glad I’ve met her and Manu – and I just have this feeling that this wasn’t the last time. Crystal, by the way, is a hell of a brave woman – she moved with three kids (and her mom) from Ohio to Colorado in the hope of providing their kids with a better future. Respect! There was still at least one person from my Twitter timeline that I knew would be there and wanted to see: Birgit from Denmark. When she posted a picture of her, Manu and Crys, I knew who to look for – and so, in one of the breaks between two panels I found her – talking to Jan, the man from the row in front of me, also Danish (both in their mid-60s I think). She immediately gave me a big hug and told me she was so happy to meet me. So was I! There was this instant connection again, just as if we had known each other for a long time. I think Matteo turned up at that point again, and so both mine and Matteo’s circle of sensate friends had expanded again. The way it turned out, Birgit, Manu, Crystal, Matteo, Jan and I ended up having Pizza together on Saturday evening – diverse yet united. This evening, combined with what had happened before in the panels (more about that soon), made my heart feel so full of love it was almost bursting. I went home with the renewed belief that Sense8 is, indeed, much more than „just another TV show“. Those of you who were there with me will know what I mean, to those who weren’t I will try to explain a bit more how the attendant Sense8 actors played into that in another post. There would be more to tell about other encounters, such as with the 22-year-old woman with red-dyed hair from Spain, whose name I’ve forgotten 😳 , but who paid me the sweetest compliment, being quite shocked when I told her my age: „I thought you were MY age!“ 😉 Or when I was still looking very sad after leaving the closing ceremony and a woman I hadn’t even noticed before asked me whether I needed a hug, then gave me one and comforted me by saying that I should simply look forward to next year. I also got to say „hi“ to Nicole from London and her sister but, unfortunately, we didn’t really talk that much. But I’m pretty sure we will run into each other in London some day.